In August 1850 a report from the Irish Examiner, covered the story of the poor who were travelling from Limerick to America in attempts to escape the aftermath of the famine that ravished the country, and how they were exploited at every turn. One case was that of the schooner the Hornet that left Limerick for New York. The ship was owned by the Sidley Brothers of Henry Street and captained by a man called Wells. Several of the 82 passengers had paid for beds during the crossing but on boarding, they found that they had to sleep on deck. During the voyage, Timothy Carty from Hospital queried to Wells for his bed and was told ‘go and sleep there with the women’. On his arrival in New York, Carty pleaded with the Commissioners of Emigration, the police and the Mayor’s Office before hiring a lawyer to get his £3 16 shillings returned. In 1848, the Sidley Brothers sent the Heather Belle to New York with 110 passengers. On 17 September 1850, on a return journey from Quebec the ship, which was laden with timber, wrecked. The crew were saved and the vessel and cargo was insured. 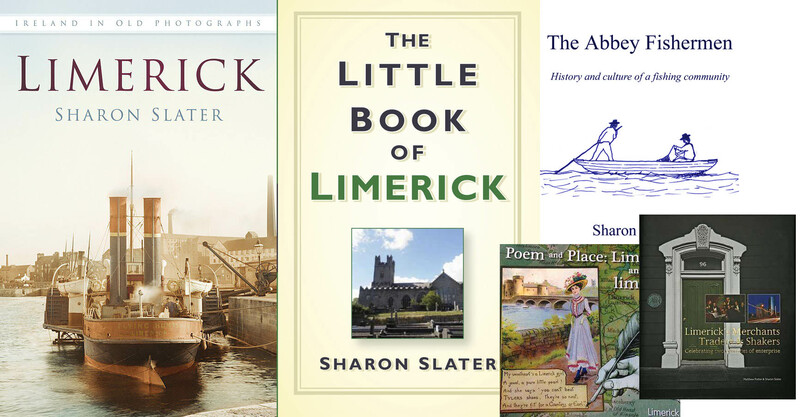 In 1854, the Sidley’s chartered two more ships, transporting 380 poor women and girls from the Limerick workhouse to Quebec. 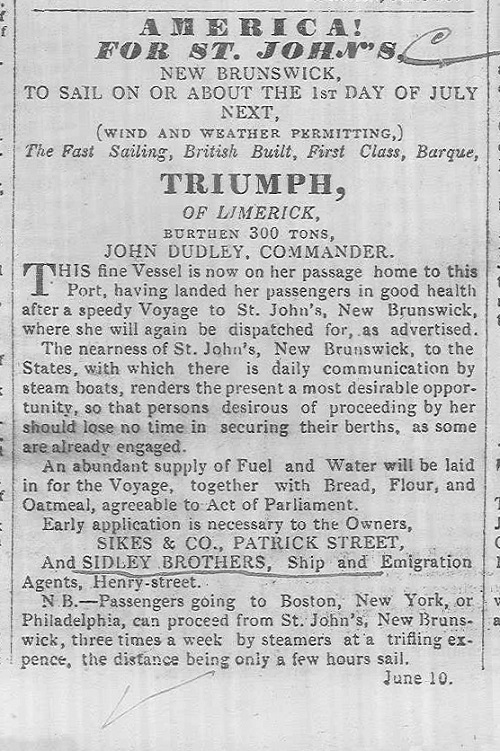 In 1858, their ship the Triumph became waterlogged after being caught in a hurricane on her return journey from St John’s in Canada to Limerick. The crew, which consisted of Bartholomew Stapletton of Kilrush, Clare; Daniel McCarthy of Castlegregory, Kerry; Jeremiah Dillon, P Baker, J Connelly, William Levers, P Peek Beale, all of Limerick, were rescued on Christmas day by the American ship, the Cordelid. Later, on 14 May 1860, their ship the William and Joseph sailed for Quebec with 109 passengers on-board. These passengers received the following rations during the crossing: ‘3½ pounds of biscuits; 1 pound of flour; 1½ pounds oatmeal; 1½ pounds rice; 2 pounds potatoes; 1½ pounds beef; 1 pound pork; 1 pound sugar; 2 ounce tea; 2 ounce salt; ½ ounce mustard;+ ¼ ounce pepper; a gill of vinegar and 3 quarts of water daily’. The Sidley Brothers were Isaac, John and Richard, and they had at least one sister called Anne. Their parents were Richard and Anne, who are buried in St Mary’s Cathedral. Isaac became a freeman of Limerick in 1852 through his wife Annie (Gertrude) Myles, who he married in St Munchin’s Church of Ireland on 3 July 1849. The couple moved to Australia where Isaac died on 23 November 1864 in Geelong, Australia. John operated as a shipping agent from at least 1846 until 1861. Richard died in January 1860 at his home in Richmond Terrace, aged only 36. As a mark of respect, all the ships in the docks had their flags at half-mast.